After a long time of inactivity, I decided to leave my den from where I hibernated. today I use a weapon of massive safeguard of the 'rétro patrimoine' (french copyright) : D.
To constitute of a vehicle which with already proven reliable I decided to pass to the serious things by adding true to him a trailer . This I say will not seek R-360. 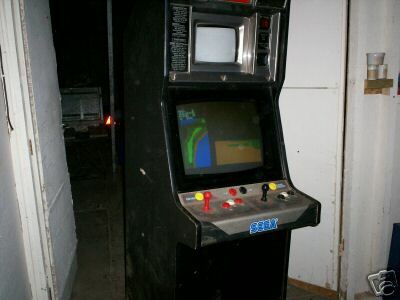 In fact, the objective is to recover a doubles screen cab in “Mint” condition. The owner with have evil to release it but good, considering the state that is worth the blow ^-. The second is great classic of Taito with Gun. I saw some passing two to the sorrow y' has one month 1/2 , of the blow I folds back itself above. And finally the last a atari which I will have tendency to call “credits”. I will ask you for a small silence minute: (to the attention of Nikos69 which prefers outward journey boser rather than to accompany me: D.
After a good small meal and the desistance from Nikos69 (Hello Nikos ). Direction the adventure and beyond. I benefit from a small installation to ensure me that the road is always there - > photo memory. Is necessary to say that the copilot having released me (not reliable these small sizes that fall from sleep) I had to stop me to check the road. Arrived on site and after a few moments here us are at sharp of the subject. They are there : -)= and fully functional. I like the life . More than one year that I had located them. Following my mishap of at the beginning of June (two opé Wolf and a roadblaster inter alia to the bucket :O ) I organize myself to recover all the cabinet located. It is necessary to make quickly to save alls the cab >: D.
While I am there I profit from it to take photographies from more recent relics. Steel talons from Atari before the 3D mapping games. The other end being in another room. As at step badly of owner y' has hardwares a little everywhere, I profit from it to photography. 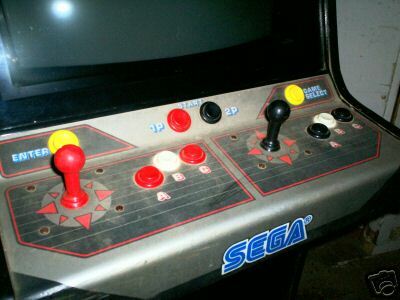 A Virtua Racing control panel. A lot of generic cab . A lot of french 'JEUTEL' Cocktails. Go, it is done and one decides to set out again, direction the house to deposit these toys of another age. On the road traditional a small stop in Mac C in order to take again forces it must be in the 19H30. More 12H that the RT with started I start with marked tiredness and I have a little evil with décoler . Small vision of the cabinets installed in my weapon of massive safeguard (ok, has place today) but, i will have of them perhaps a little less the next time . Arrived at 2Kms of the house, the 'tuille' , meets with a reaping-machine threshing-machine launched at full speed. Small zoom on max. speed On my meter I have the same . The technical support “Camera” being occupied descending the cab you will not see the detail of the descent of a System 1 from a trailer. Opé Wolf in its future house :-)=. And, if you noted it there were three cabs to recover at the beginning of the adventure It is there, the last cab in state “mint” for the owner (I do not have this opinion but good…). It is about a megatech from SEGA, technically it acts of mégadrive. And, just like concurent it Nintendo PLAYCHOICE 10 this cab is equipped with two screens. The screen top being used to select a play (see the rules). It is especially it which with justified my displacement. The sytème 1 and opé Wolf being easier to find. Small overall photograph of new acquisitions ^- which all are functional (that changes). I bought the trailer especially for the after burner deluxe . I already found it but I do not have the place to store it for the moment. Indeed, the three cabs are functional. The opé Wolf and system 1 side art are diluted but it is not too serious. 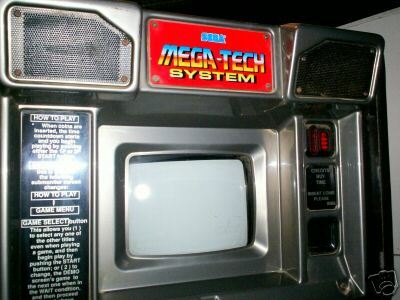 The small screen top of the megatech is beautiful, no burn because the cab with very little turned. Only 1700 parts. I bought for my future game room which will make 45m². Let us know when you fire them up, curious just like Bruno if the top-screen of the Sega Mega-Tech works. Your story really makes me wanna do a roadtrip a once again. Keep up the arcade life style !